Fone frow 1, originally uploaded by birdlouise. As demonstrated by Bird Louise with this camera toss photograph posted to our community gallery on flickr. 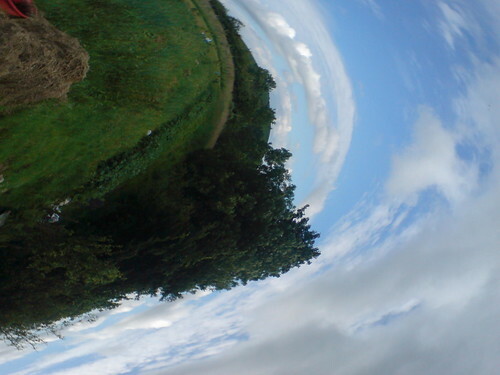 Interestingly the distortion achieved with this simple interaction of the sensor and motion resembles the very popular digital transform manipulation referred to as micro planets, typically achieved with panoramic techniques and coordinate re-mappings. But seen here produced entirely in camera! But boy is the sentiment accurate. Just under 3 days before my departure to Europe on the Nokia Urbanista Diaries project and today I was informed by FedEx that my necessary hardware gear (N82 model phones, SIMs, etc etc) being shipped from London is now stuck in US Customs due to paperwork errors. What else could go wrong? Well we have yet to reconcile the nature of a photo license agreement with Nokia for the project! Hmmm what else. Ohh the fact I don't own a credit card thusly no Hotel accommodations beyond the first city have been made. I suppose all the disorder is appropriate for someone who actively encourages people to embrace a little more chaos in their image and art-making. Irony can be a headache sometimes. Wish me luck. Shortly I will be posting some tools beyond the interface Nokia provides for keeping up with me on the journey, now obviously destined to be brimming with chaotic forces.